Keeping your kitchen extract clean is essential and could prevent fires. Between 2010 and 2011, the London Fire Brigade recorded 166 restaurant fires. A very high proportion of these fires started in the Extract Ventilation System as an excessive build-up of grease. Grease deposits are easily ignited by the smallest flash fire from the fryer, hob or grill. Many restaurant insurance policies contain specific conditions relating to regimes of kitchen extraction cleaning, and if a fire that occurs within the extraction system proves to be associated with inadequate cleaning, it could jeopardise a claim for loss or damage. While the economic downturn is depressing, cutting back on expenditure in your business could prove even more dangerous. It is worth bearing in mind that almost 25% of the 24,000 accidental fires that occur every year in commercial properties are related to cooking and extraction systems. Reducing the standard or frequency of your cleaning regime could be a costly error. Keeping your kitchen clean in your working environment is essential and could prevent fires breaking out in ducts or hoods. It is vitally important that you are thorough in your regime and do not neglect out of sight areas. Failure to comply with required standards of cleanliness and maintenance could be putting your workforce in serious danger where ultimately you are responsible. You could also run the risk of prosecution following a fire if you have not complied with the law and had your hoods and ducts professionally cleaned and maintained by an HVCA/BESC registered company. A fire associated with inadequate cleaning in your working environment could also prove costly for your business if your kitchen is out of action for a significant period of time. Business interruption costs are likely to be high, particularly for a restaurant or licensed premises. 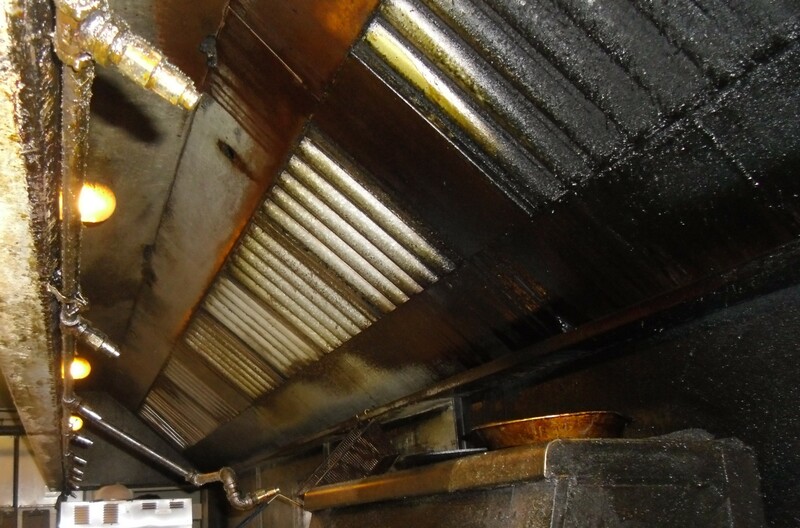 By continuing to raise awareness of the dangers of ignoring grease and oil build-up in kitchen extracting systems, the insurance companies hope to make a significant impact in reducing these types of fires. It is a legal requirement that fire risk assessments should be carried out by the ‘responsible person’, and any necessary steps taken in order to reduce potential fire hazards. Keeping training and maintenance records is crucial. Should a fire or an accident occur on your premises, these records may be your only protection against prosecution. Ocean Industrial Cleaning provide a post clean report detailing potential risks, Ductwork Deposit Thickness Test (DTT) results and Photographic evidence of the work caried out during our maintenence program. LET US TAKE THE WORRY OF FIRE RISK AND POSSIBLE PROSECUTION OUT OF YOUR HANDS AND CONTACT US WITHOUT DELAY.